FREE foam underlay worth £2/m with this floor ? 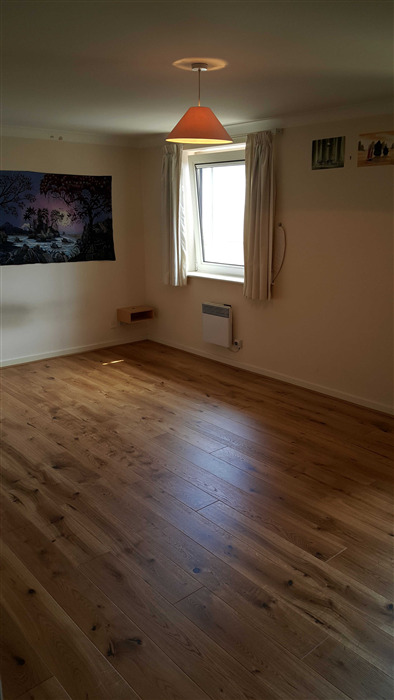 Natura Belfast Engineered Oak Wood Flooring is an engineered plank floor with a brushed, matt lacquer finish. 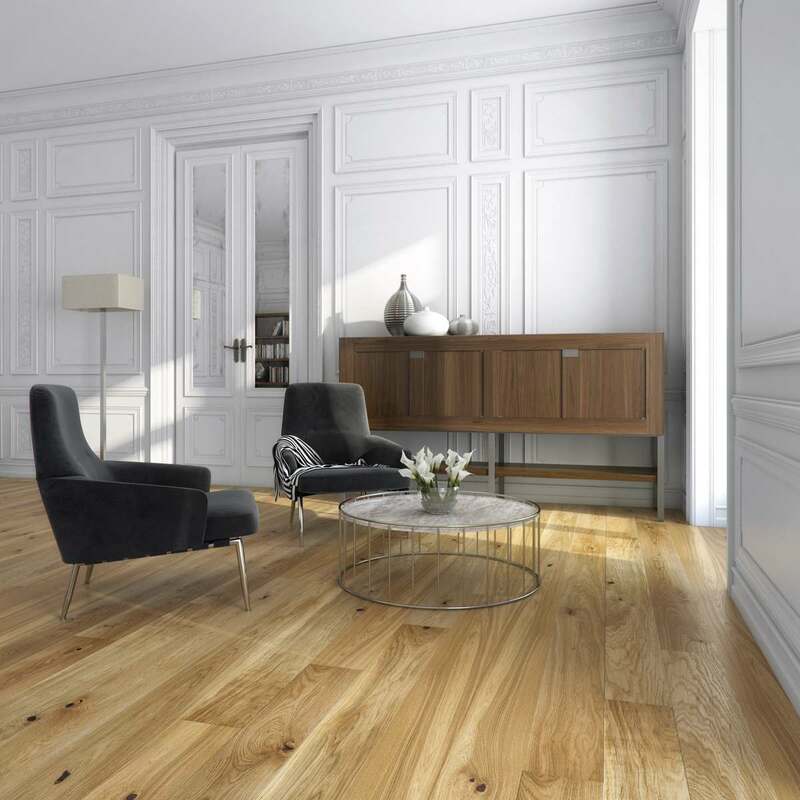 The bevelled edges help to create a feeling of days gone by, while the brushed surface and matt lacquered finish gives a real depth to this wooden floor. This oak wood floor looks especially good in a modern setting despite the vintage appearance. Chantel at Flooring Supplies was a superb example of what all sales employees should aspire towards. Chantel was informative, pragmatic, honest and diligent throughout my sales experience. I cannot fault her knowledge of the products and her ability to tailor products that suit customers requirements was impressive. I would highly recommend Flooring Supplies and have already done so to friends. Chantel high lighted points during my sales experience that no competition had mentioned before and I am truly grateful. Having spent approximately £2000 on flooring I was more than happy for Flooring Supplies to have my business now and in the future. Very happy with the quality of the floorboards and the floor looks great now it’s laid. There are however quite a few knots which have been filled with a dark filler ... but if you allow for extra boards that can be resolved. The overall effect is very attractive and we are very pleased. Can this floor be installed on top of floor joists? Or is sub floor boarding required? This isn't a structural board so we don’t recommend installing directly to joists, you would need to ply it first and then install the Belfast flooring on top. Hi, I had this floor installed in March 2016. While building work was completed the floor sustained a few scratches which look white and are very obvious. Can you please advise how to treat these or any products I can use to disguise them that would prevent further scratching? thanks. 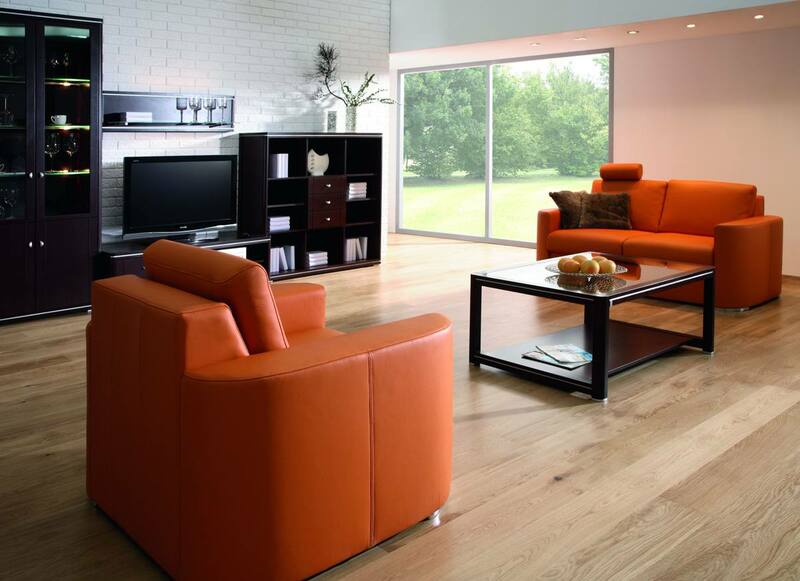 The Oak Belfast has a lacquered finish so this a great floor as it has minimal maintenance requirements. To answer the question with regards to extra coats of lacquers etc... this floor has around 6 coats of lacquer already so no need for any further coats. The lacquer used is a clear matt lacquer so to match up trims with this floor this is the type of lacquer to use. Can you use this flooring in the bathroom. I see you say in a previous question that the floor is waterproof, but wanted to check this before purchase in case it invalidated the guarantee or something if used in the bathroom. Can this product be laid over underfloor heating (water based)? What is the natural wood adhered to - ply or softwood. Also is this suitable for a household with dogs? 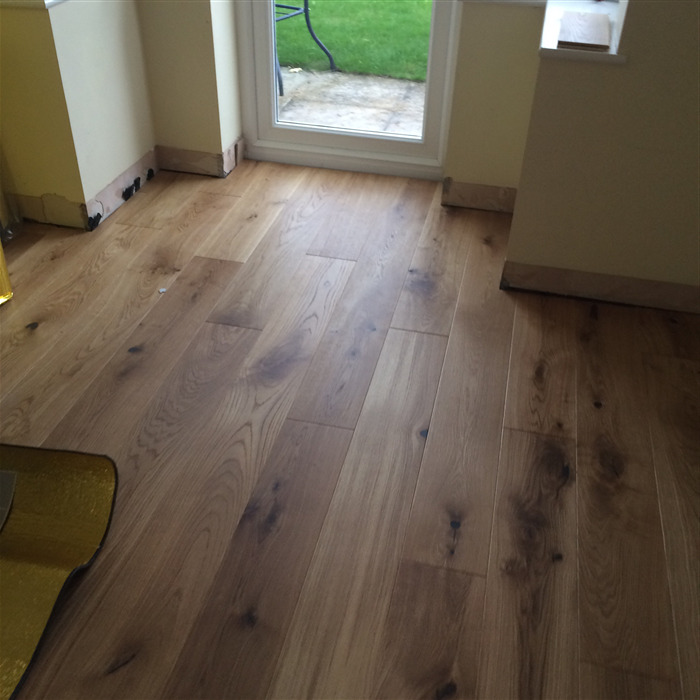 The ply construction is described as a 3 ply which is soft wood. The Oak is glued to the mid core which is pine with a stabilising base of spruce (all real wood). Yes dogs would be fine but just remember being real wood the flooring will mark, dent and scratch over time. Tip: If you have a large bouncy dog get there claws clipped regularly. This will help to protect the floor from marking. You can use this floor in a kitchen as it is water resistant. However, it is suggested that spills etc. are cleaned up in a reasonable amount of time. If there is sitting water for a prolonged time this could affect the floor. The rule here is just to be sensible.